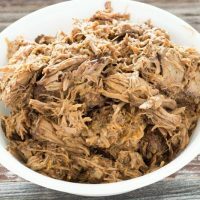 Slow cooker barbacoa beef tastes the best when it has been slowly simmered in a spicy and flavorful broth. Perfect for burritos and burrito bowls! 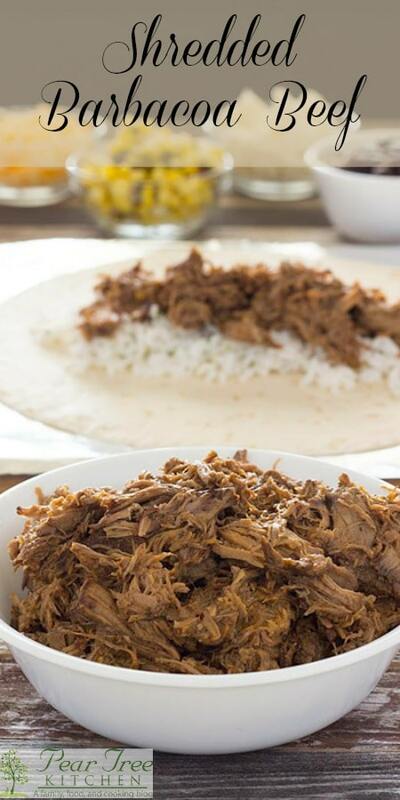 No need to rush out to a burrito franchise when beef barbacoa is this easy to make at home. Barbacoa Beef is the only reason I walk into Chipotle. Who doesn’t love Mexican Food? With Mexican restaurants being more abundant than any other international restaurants in any given town, you would guess that everyone at least likes it. Well, guess again. I have one in the household that doesn’t like Mexican food, at least the kind you get at a restaurant. He will eat tacos and fajitas that I make at home, but they are not something I would consider remotely authentic. Taco meat made with a packet of seasoning or chicken marinated in a different packet of seasoning are not my idea of Mexican cuisine. But alas, I will make them just because both are easy and both will get eaten. Bacon Quesadillas are considered Mexican to this person who shall remain nameless, delicious and addictive, but certainly not Mexican. 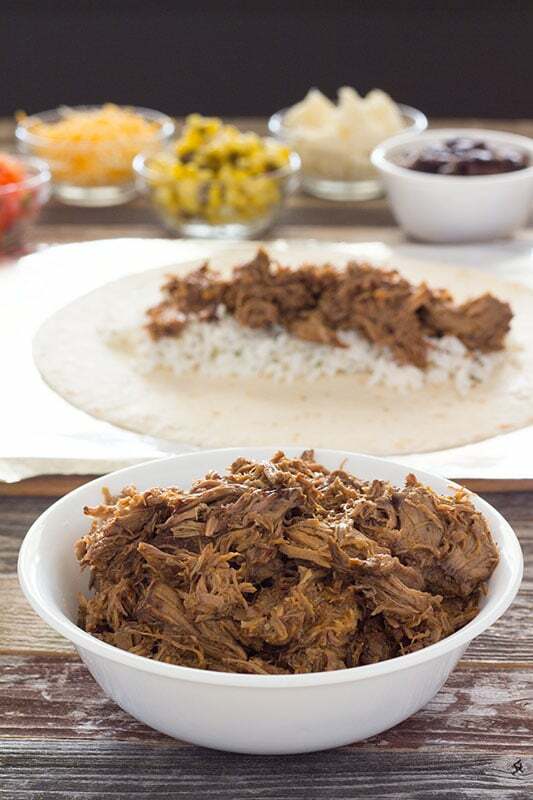 Now my idea of a Mexican dish looks more like this Barbacoa Beef piled up in a burrito or burrito bowl. Do not let the long list of ingredients scare you off. Barbacoa Beef really is pretty simple to make. It takes a long time to make, but that is what it takes to get meat the is melt-in-your-mouth tender. Isn’t that true with most simmered meats though? I don’t know if this is authentic or not. I don’t know if Chipotle is authentic either, but it doesn’t stop me from eating there or trying to recreate their recipes at home. I just know that I really like it. I make a large batch every now and again. I freeze what I can’t use within a few days. Double the recipe f you need Barbacoa Beef for a crowd. Each recipe makes about 20 servings. The first day I use it for burritos and then the next few days I turn it into burrito bowls. A copycat Chipotle Burrito Bowl to be exact. When I make a Barbacoa Beef burrito bowl, I layer my cilantro-lime rice on the bottom, add a layer of black beans, and finish with some meat on the top. I can microwave the entire thing and add my toppings. My favorite toppings are pico de gallo, corn and roasted poblano salsa, guacamole, lettuce, and Queso Fresco cheese. Yes, I know Queso Fresco cheese is not intended for this purpose, and Monterey Jack Cheese would be the Chipotle way, but it is my burrito bowl and I will make it with ingredients I like. If Chipotle offered Queso Fresco I would order it, with a straight face and have zero guilt. I encourage you to do the same. Put whatever it is you like in your burritos and burrito bowls! This has a bit of a bite, so I do suggest something to cut the heat, like rice or a tortilla. Unless you like spicy food, then go ahead and eat it with a fork. I won’t tell a soul. More chipotle pieces can be added to the meat while cooking to add more heat. But like I said above, it already has a bite in my opinion. Place oil in a skillet and heat over medium-high heat until hot. Add beef pieces and cook until all sides are browned. Turn often and move beef pieces around the pan to ensure even browning. Remove beef from skillet and place into a crockpot. Add apple cider vinegar, onion, garlic, black pepper, salt, cumin, cloves, allspice, broth or water, lime juice, chipotle peppers, and adobo sauce in a food processor or blender. Process until smooth. Pour sauce over browned beef in a slow cooker or Dutch oven. Sprinkle 1 teaspoon white sugar over sauce and add bay leaves. Cook in slow cooker on low for 6 to 8 hours or high for 3 to 4 hours. If using a Dutch oven cook in a 325 Degree F oven for 3 hours or until meat is tender. When meat is tender removed from the slow cooker or Dutch oven, reserve broth and discard bay leaves. Allow meat to cool slightly. 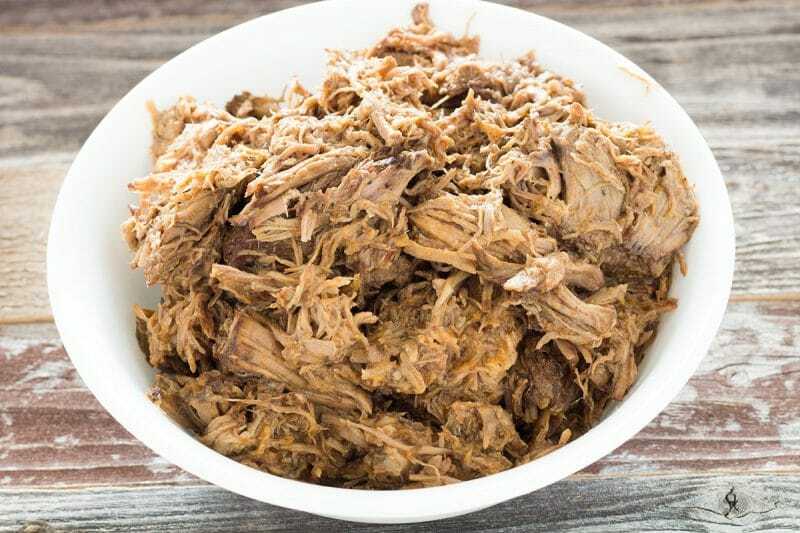 When cool, shred beef and put back into the slow cooker or Dutch oven. Add enough reserved cooking liquid to moisten the beef. Continue to cook beef for another hour. Chipotle peppers can be reduced if you do not like your food super spicy. Start with two, taste the sauce and add more until desired heat is achieved. Skip the sugar to make this recipe paleo and keto friendly. Nutritional calculators vary, please consult calculator of choice if the information is vital.